Spring has come early in the Northeast – we hopes it stays – but getting the drapes pulled off seven Jeep Safari concepts was an early present for motorheads everywhere today. The 50th annual event coincides with the 75th anniversary of the Jeep brand. Trying to pick a favorite is presumably as tough as picking your favorite child. There’s a Hellcat version of a Wrangler called Trailcat. Yes someone will want 707 horsepower in a Wranger just because Ralph Gilles have found a way to do it. And he wanted to. Whether you wish to walk or spring, it’ll do it. Nostalgic is shown in the FC 150, the old is new again cab over design that can tackle any trail albeit slower than the Trailcat of course. Electronics may be shorting out everywhere over the Jeep Comanche pickup concept. Merge a Wrangle with the old pickem ‘up and you get this retro, cool Jeep. Maybe this is why Sergio deep-sixed the Dodge Dart and Chrysler 200, eh? Well some folks can dream. The Shortcut is a nod to the CJ 5 series of Jeep fame. The Crew Chief 715 salutes egendary Jeep military service vehicles; the Renegade Commander could blaze a trail deep into the wilderness, a Comanche blends being off-road ready with practical utility while the Trailstorm adds a 2-inch lift kit, 37-inch tires and Dana 44 axles. The Jeep Renegade Commander concept vehicle is equipped with an assortment of Mopar and Jeep Performance Parts for the ultimate off-road adventure. A 2-inch lift kit and 17-inch Rubicon aluminum wheels with 29.5-inch BFGoodrich All-Terrain T/A KO2 tires increase the off-road capabilities of the Jeep Renegade Commander. The Comanche’s “Beige Against the Machine” concept exterior paint is accented with a Satin Black hood, a concept lower front fascia, winch, steel rear bumper, soft top and spare tire in the bed. The wheelbase has been stretched an additional six inches versus a production Renegade to accommodate Comanche’s 5-foot bed. Inside, the Comanche features custom seat covers, pedal covers, door sill guards and Mopar all-weather mats. Jeep Performance Parts like off-road rock rails, a 2-inch lift kit and a winch bolster the Comanche’s off-road capability. The Comanche rolls on 16-inch painted wheels and 32-inch BFGoodrich All Terrain T/A tires. A true American workhorse, this 1960 Jeep FC 150 concept vehicle is rich with heritage and built to tackle both challenging rocky trails and the harshness of a western cattle ranch. Originally built from 1956 to 1965, the FC 150 is based on the CJ-5 and offers a clever packaging solution by keeping overall length to a minimum for maneuverability, but maintaining a full-length cargo box for utility. This heritage Jeep vehicle continues to utilize its original steel body that proudly bears battle scars while components underneath have been revamped. The FC 150’s off-road prowess has been enhanced courtesy of a 2005 Jeep Wrangler chassis modified to accept a Dana 44 front axle, Dana 60 rear axle and 17-inch white steel wheels wrapped in 33-inch BFGoodrich Mud-Terrain T/A KM2 tires. Keeping their streak of special editions alive, Jeep rolled out a new Wrangler Dragon Edition adorned with Black and Bronze Satin Gloss exterior and interior spiffs. The special edition model in was carried an Manufacturers Suggested Retail Price (MSRP) of $36,095. The edition follows the Wrangler Dragon Design Concept at the Beijing International Automotive Exposition to wide acclaim across the globe, and particularly throughout the Jeep enthusiast community. Based upon the Wrangler Sahara, the dragon is meant to symbolize strength and power and is associated with royalty and good fortune. Available only in Black as a 4-door Unlimited model , the Jeep Wrangler Dragon Edition features Bronze Satin Gloss trim inside and out. The Jeep Wrangler Dragon Edition is painted Black with a black body-color 3-piece hard top. Bronze Satin Gloss details are also on the front grille slats, headlamp surrounds and Jeep badging. Unique 18-inch 5-spoke alloy wheels are matte black with a Satin Bronze high-gloss outer edge. The exterior also features gloss-black appliques on the front and rear bumpers, and a Dark Charcoal dragon decal that starts on the hood and runs along the driver’s side of the vehicle. Final exterior touches include a Mopar® fuel-filler door and a black spare tire cover with dragon decal. The black and bronze theme continues inside with heated black Nappa leather seating surfaces with Satin Bronze Dragon Scale on the outer bolster surfaces, center console arm rest and steering wheel. 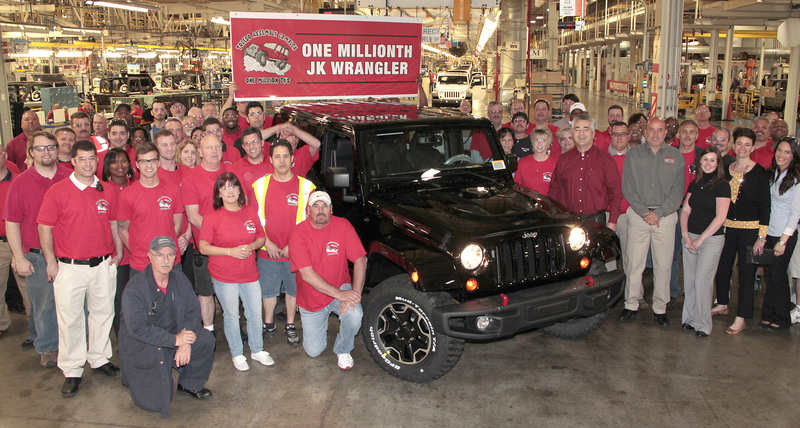 One of the most iconic vehicles in the US and perhaps the world, the Jeep Wrangler, celebrated its one-millionth iteration rolling off the Toledo, Ohio production line recently. With the usual gusto, balloons, and well-deserved bravado, Jeep had a proud moment at its production line that’s well deserved. The full presser can be read below. Mauro Pino, Chrysler Group’s Vice President of Vehicle Assembly Operations, and Dan Henneman, Jeep Unit Chairman of UAW Local 12, drove the black 2013 JeepWrangler Rubicon 10th Anniversary Edition, bound for a customer in Sarasota, Fla., off the final line. 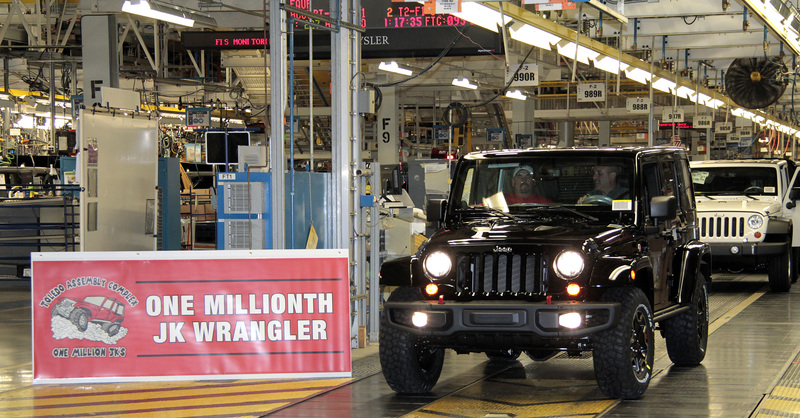 “Every Jeep Wrangler sold to customers around the world is born in Toledo, Ohio,” said Pino. “Since this facility opened eight years ago, the Toledo workforce has built every one of those million vehicles with pride, passion and a focus on quality. We all look forward to building the next million.”Since 1941, Jeep – the original sport-utility vehicle – has represented freedom, authenticity, adventure and passion. The 2013 Jeep Wrangler is recognized and respected by top automotive influencers, garnering numerous awards including Specialty Equipment Market Association’s Hottest 4×4 SUV; Petersen’s 4-Wheel & Off-Road Magazine’s 4×4 of the Year; Texas Auto Writers Association’s Mid-Size SUV of Texas; Kelley Blue Book’s Best Resale Value Award for Compact Utility Vehicle; Kelley Blue Book’s Top 10 Best Resale Value Award; Autobytel.com’s SUV of the Year; and Four Wheeler’s Four Wheeler of the Year Award. Connected under one roof with the North Plant, where the all-new 2014 Jeep Cherokee will be built this year, the Toledo Assembly Complex’s Supplier Park began production of the Jeep Wrangler and Wrangler Unlimited in 2006. Located on the same site as the former Stickney Plant, the complex includes body and chassis operations, produced in partnership with suppliers Kuka and Mobis, respectively. The Stickney Plant was built in 1942 and nearly two decades later, was converted to produce the Jeep Grand Wagoneer. The facility became the Toledo Assembly Plant when Chrysler Corporation acquired American Motors Corporation (AMC) in August 1987. In the fall of 1997, Toledo North was built for the production of theJeep Liberty, which launched in April 2001, and later added production of the 2007 Dodge Nitro which launched in August 2006. The last Jeep Liberty and Dodge Nitro rolled off the line in August 2012 and December 2011, respectively. Toledo North will add 1,105 new jobs on a second shift in the third quarter, bringing total complex employment to more than 3,000.